Elysium is a crochet pattern for a pretty striped blanket with a simple but interesting ripple pattern that crochets up quickly. 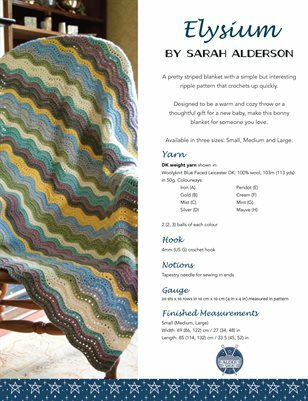 Designed to be a warm and cozy throw or a thoughtful gift for a new baby, make this bonny blanket for someone you love. Available in three sizes: Small, Medium and Large.